Why Engage Community Members in the Design of a University Library? I grew up in a college town. Swarthmore College worked hard to maintain good relations with the people who lived and worked in Swarthmore, PA. But nobody from the College conferred with local residents about the design of on campus buildings. I imagine the architects involved in the design of each college building consulted with the administration, the faculty, and the users of the proposed building. But to my knowledge, no thought was given to the function that a college building might serve in the broader community. That's why I've been excited to be a part of the team that is engaged in the conceptual design of a new university building for the African Rural University in Uganda, using a completely different approach: where the students, and the graduates, and the people served by the university graduates have all been actively involved in envisioning this new library/resource center. To read my full description of the process to-date, please see this post, on the site of the African Food and Peace Foundation, the philanthropic thought leaders who are helping to raise money for this new library/resource center in East Africa. This is the current University Library. Here's the conceptual vision that resulted from 2 years of co-design and visioning, as created by Mass Design Group, an innovative architectural firm located in Ruanda and Boston. These are the constituents being served by the University students and graduates who have been involved in the librarly visioning process. 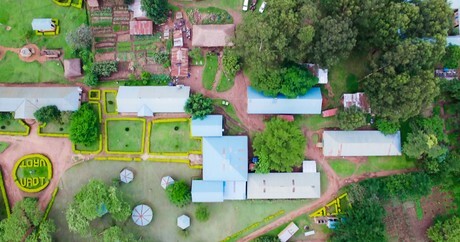 Here's an overview of part of the 80-acre campus that houses the African Rural University. I led the first visioning session in March, 2013. Members of all of these institutions that share the campus engaged in these participatory design sessions held from 2013 to 2016. 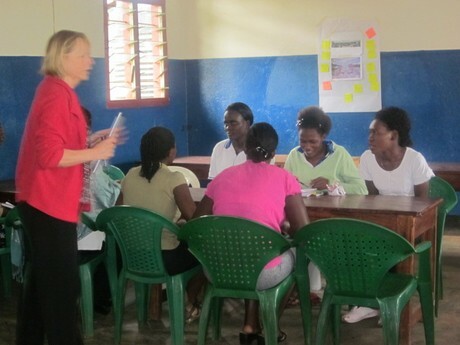 The visioning continued in 2014, 2015, and 2016. This spring, Mass Design Group professionals finalized a campus-wide plan and began to hone in on the requirements for the Library/Resource Center. A way to store seeds and other agricultural inputs and outputs. A living museum for the preservation of utensils and tools from native Ugandan people over the years. A place to catalog, store, and access the many multimedia products generated by students and local citizens, such as radio programs, video footage and documentaries. Great, well-curated LOCAL research as well as online access to data sets. Ramps, rather than stairs, to access all floors of the new building. Lots of computers and power sources -- running off of solar energy. The ability to access any library resources from mobile devices in the field. We welcome your involvement in this exciting initiative, which will positively impact the lives of 2 million rural Ugandans, living in the area served by the African Rural University.